"The natural state can be described only by negation; as, uncaused, independent, unrelated, undivided, uncomposed, unshakable, unquestionable, unreachable by effort. Every positive definition is from memory; and, therefore, inapplicable. And yet my state is supremely actual; and, therefore possible, realisable, attainable." Turiya is the aware background against which the three mental states (waking, dreaming & deep sleep) take place. It is the coming to rest of all differentiated, relative existence. This utterly quiet, peaceful and blissful (non-mental, Real) "I" illuminates the other three states and is the ultimate aim of all spiritual activity. The waking state corresponds with the gross, physical plane. 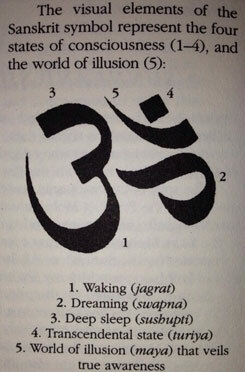 The dreaming state corresponds with the subtle plane. The deep, sleeping state corresponds with the causal plane. Turiya corresponds with the great causal plane. Turiya is the embodiment of transcendental consciousness itself (our true nature, pure thoughtless awareness), not a manifestation of it. See also: There is only One Self; Two Scriptures; Dream; and, Declaration. One will aspire to what's real only to the extent one realizes that appearances are false. Detachment emerges as one's discriminative ability increases. Renunciation occurs when the futility of seeking happiness through external things is irrevocably impressed upon the mind and one is no longer affected by the passing scene. Reverential adoration is offered first to Shri Ganesh (Lord of meditation), second to Shri Saraswati (Lord of the exposition of the Truth); and, then, third to Shri Sadhguru (who arises in one's heart by adoring the first two deities). The Sadhguru's only aim is to help one to be free of ego and identification with the body and the mind. Parabrahman: All-pervading and eternally free Supreme Reality. Natural spontaneous (stateless) state which remains when "I Am" and all concepts are let go of. Paramartha: Supreme or Ultimate Truth. Paramatman: Supreme Self. Siddharameshwar says: "Paramatman has neither roots nor branches." Brahman: The spontaneous, shapeless, qualityless, unchangeable natural state which remains when the four bodies reach their end. Siddharameshwar says: "There is no activity, no movement, no entry and no exit in Brahman." Ishwara: Self. God. Sat-Chit-Ananda or Being-Consciousness-Bliss. Swaroopa: True Self Nature or true form which is the same in the jiva and Shiva. That which remains when the four bodies of both the jiva and Shiva are given up is beyond imagination. It is steady. Atman: Self. Ever changing Inner-Self that carries out all worldly affairs. It vanishes upon realization of Swaroopa. 4. (8.) Great Causal Body: Original promordial illusion (which can only be indicated). Sat-Chit-Ananda. Same as the Great Causal Body of the Jiva (individual). 3. (7.) Causal Body: Space from which the universe appears. Same as the Causal Body of the Jiva. 2. (6.) Subtle Body: All animation of manifestation. Ultimately, the Subtle Body of Ishwara is the same as that of the jiva as both can be expressed in words. Represented by Brahma, Vishu & Shiva. 1. (5.) Gross Body: Entire physical universe (macrocosm). Ultimately, the Universal appearance of the Lord and the gross body of the jiva are the same as both contain the same five elements. 4. Great Causal Body: Pure Consciousness which can only be indicated. Sat-Chit-Ananda. 3. Causal Body: Source of the world. Sheath #5: Sheath of Bliss. Sheath #4: Sheath of Vidnyana. Higher and subtler aspects of intelligence. Sheath #3: Sheath of Manas (mind). Cognition and intelligence. Sheath #2: Sheath of the 5 Pranas. Sheath #1: Sheath of Food. Material elements. ξ Any questions? Send an email, including your name and phone# in your message. Someone will respond. For answers to your most essential questions: Go here. Donate to Purnameva Mission.